David E. Van Zandt is no stranger to the New York region. Born in Princeton, he grew up in Central New Jersey and attended Hunterdon Central Regional High School before returning to Princeton for his BA in Sociology. But the ardent Yankee fan, who was just named The New School’s eighth president, did not always have a positive association with the city. Even now, Van Zandt is more comfortable with his sleeves rolled up than in button-down finery. His preference for informality extends to his demeanor, which is low-key and approachable. And his affection for New York has transcended his boyhood association with coarse fabric. Today he’s all about The New School. Van Zandt, 57, assumes the presidency on January 1. 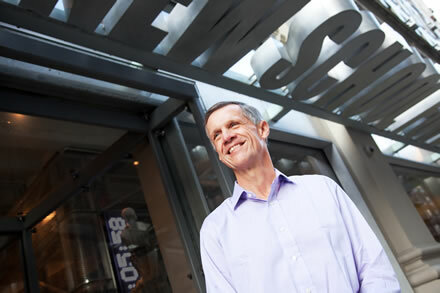 He comes to The New School from Northwestern University’s School of Law where he has been dean since 1995. In his 15-year-tenure, Van Zandt’s visionary leadership transformed the school into a top-tier institution known for academic quality, research-intensive faculty, and student engagement in social issues. For that kind of transformation to succeed, Van Zandt recognizes that you need students with an edge, the kind who choose to come to an unconventional university. Van Zandt admits he has his work cut out for him over the next few months. In addition to completing his service to Northwestern, he will become a student of The New School’s legacy and its challenges, and will seek out opportunities for the university to become a leading voice in the future of higher education. At Northwestern, Van Zandt became an outspoken brand ambassador, he wore a touch of the school color, purple, every day. How will David Van Zandt embrace The New School’s colors? Note to prospective designers: may we suggest an orange lining?